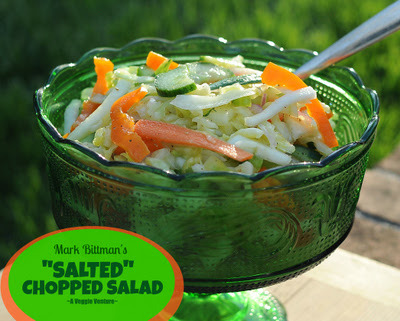 Today's new vegetable salad recipe: Mark Bittman's chopped salad recipe, the one from last week's New York Times, the kind of salad you can make every few days, adding and subtracting vegetables as you see fit. Healthy. Low carb. Low points. Not just vegan, "Vegan Done Real". Michael Pollan's new book Cooked: A Natural History of Transformation is on my read-soon wishlist. It rethinks our adventures in the kitchen, following four elemental ways of cooking. FIRE That's captured fire like a gas or electric stove or the open flame of wood fire. WATER That's boiling and braising. AIR That's baking. (Have you ever thought of an oven as just a small furnace? Me either.) It's also air-drying thin-thin layers of meat, say, as the Swiss and other Europeans do. EARTH That's the action of fermentation, whether cooking up some homebrew or making cheese. Peeling and chopping, slicing and dicing, these are the constants of a vegetable lover's kitchen, the acts that come before Earth, Wind, Water and Fire. This salad takes more than the usual measure, leaving time to consider which element of cooking would be applied here, when salt is applied to "cook" the vegetables just enough to soften and infuse with freshness and flavor. I suppose, yes, it must be "Earth"? No matter. I was much taken with this salad. It's a sort of slaw, I suppose, except composed with a cornucopia of crisp raw vegetables and substituting the acidity of lemon for vinegar. It kept for a week, an easy side salad, a quick healthy snack. This is one to go back to again and again. For vegetables, aim for about a total of 2-1/2 pounds of chopped vegetables, adjusting the individual amounts according to taste and availability. For visual interest, choose vegetables of different colors and chop them in different shapes and sizes. SALTED VEGETABLES In a colander or salad spinner, salt the cabbage with about a tablespoon (yes, tablespoon) salt, layering the cabbage with salt as it's prepped. Put it in the sink to drain. As the salt wilts the cabbage, give it a good squeeze to remove excess liquid. Add the carrots, onion, cucumber and turnip, lightly salting each one as they're added. Let the vegetables rest at room temperature while you prep the Other Vegetables and the Dressing, Bittman says that 15 minutes is the minimum, 60 minutes the maximum. OTHER VEGETABLES Collect these in a large bowl (one large enough to hold everything) and set aside. DRESSING Whisk together the oil, lemon zest and juice, salt and pepper. RINSE Squeeze the Salted Vegetables again, really wringing out as much liquid as you can. Rinse the Salted Vegetables under running water, running your fingers through the vegetables to let water get right through. (I know, I know, it's crazy to squeeze out liquid and then add more, but trust me, this works.) Run the vegetables through a salad spinner until quite dry. COMBINE Stir the rinsed and well-drained Salted Vegetables into the Other Vegetables. Toss with the dressing. Taste and adjust, adding more lemon juice, more pepper, even more salt to taste. TO SERVE Refrigerate until ready to serve. Salad is ready to eat right away but does develop over a couple of days. It will last for up to a week, just give it a stir every day or so. TODAY'S VEGETABLE RECIPE INSPIRATION Adapted from Chopped Salad in the New York Times. NUTRITION INFORMATION Per Half Cup/Whole Cup: 32/64 Calories; 1/2g Tot Fat; 0g Sat Fat; 0mg Cholesterol; 26/53mg Sodium (NOT including added/absorbed salt); 6/12g Carb; 2/4g Fiber; 2/5g Sugar; 1/2g Protein. WEIGHT WATCHERS POINTS: WW Old Points .5 & WW PointsPlus 1/2 CALORIE COUNTERS 100-calorie serving, 1-1/2 cups; 50-calorie serving, 3/4 cup. ABOUT SALT I have no idea how to measure the amount of salt absorbed by the salad, so when I calculated the nutrition, I included only the native sodium in the vegetables themselves, no added salt. You are too much! My husband and I have made this salad twice since it appeared in the Sunday NYTimes, and we LOVE it. What a great choice to share with your readers---this stuff is delicious, high fiber, low calorie, low carb, and keeps for a while. We have been experimenting with white radishes, which we had in abundance, which add some zip. I think that this may be our recipe of the month or maybe even of the year...meaning we will make it again and again. A couple of years ago on a forum two members mentioned a salad they both made at home. It was very similar to this. Slice as much cabbage as you want and salt generously (the carrots and onion would work, too). Toss and let sit for at least 30 minutes and up to an hour. Drain. Add lime juice. That's it. I sometimes add a little brown sugar or honey (I like the flavor combination with the lime juice). Toss and serve. It's one of my favorite salads. It's especially good with fish tacos! I somehow missed this, so I'm glad you're writing about it. Interesting salad - I may have to try this. A lot of salt, but I assume a lot of the sodium drains away. I'm about halfway through Pollan's Cooked. Worth reading and quite good at points, although I wonder if once he's logged more time in the kitchen if he might change his views on some things. Anyway, good post - thanks. And what about the vitamins? Why do we eat salads if not for the vitamins? I assure you almost nothing is left after this abuse of veggies and most certainly not after a few days or a week!!! In order to get those precious vitamins one has to prepare very fresh salads. This is a wonderful recipe, Alanna. Much nicer than slaw and actually improves with keeping. My husband, who is not a "foodie", told me to make sure I still had the recipe. We also liked the Winter Tomato Salad made in a jar. Thank you for all the work you put into this. Recently tried it with sesame oil, for a fabulous flavor, as it doesn't take much of that particular oil to make it taste special.